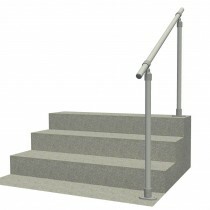 These railings use uprights to mount to a flat surface (a wood, concrete or asphalt floor). They can be installed both indoors or outdoors on steps, ramps or in a garden. The handrails will provide safe access into a building or a garden to elderly and disabled persons. The handrail kits can be configured to suit any space - if you can't find the dimensions you need, just get in touch for a free quotation. Easy to put together, the rails can be installed in no time using an Allen key (included with every kit). No welding is needed. Easiest - No tube cutting or tube drilling required. Easy - Tube drilling required. Tube cutting may be required.